We have been eating a lot of shishito peppers lately. 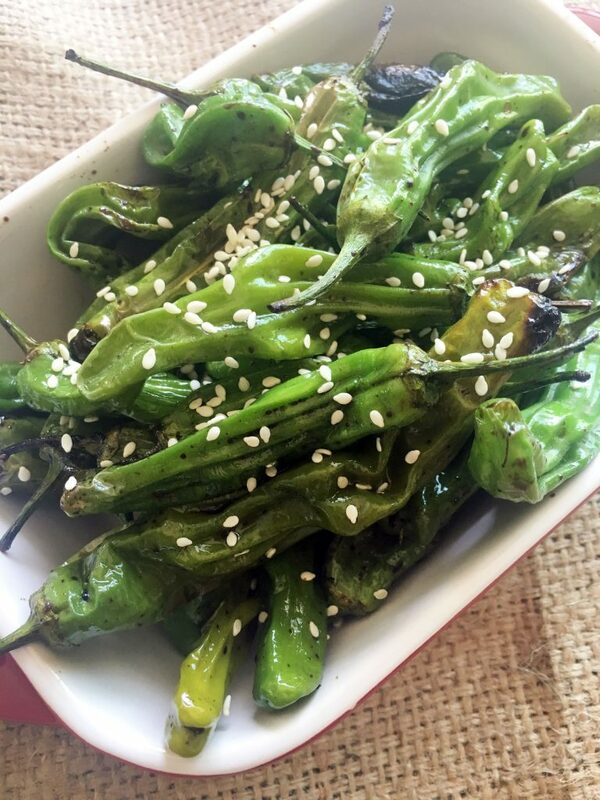 Shishitos are long twisted green peppers that are mild in heat and sweet in flavour. Well, maybe that’s not totally true. Although they are mild, sometimes a couple will sneak in that have a little bite to them. Sure we grill all year long but with the weather being hot and beautiful, our bbq is getting used more than usual. You can bet, if we have peppers in the house, they are definitely going on the grill. We like these peppers seasoned very simply. I just drizzle some sesame oil and sweet soy sauce over the peppers. Throw them in a grill basket and put them on the bbq. It doesn’t take long for them to get blistered and charred. Once off the grill, I sprinkle some sesame seeds all over. These shishitos are delicious. They are great as an appetizer or make the perfect accompaniment to barbecued anything. These are not only a hit by everyone in our house but even our parents love them. You can usually find shishito peppers at any Asian market. On my search, I found that they were sometimes referred to as twisted peppers.